Hello again, everyone! Last time I got the chance to write a blog for Paizo, I said that Alahazra was my favorite character. However, I have a confession to make: I lied. At the time I wrote that blog, Alahazra was no longer my favorite character. 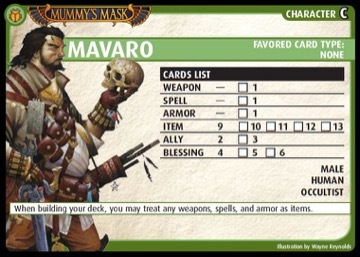 You see, I was one of the lucky few to get in on early playtesting of Mummy's Mask, and the first time I ran through the scenarios, I played as Mavaro, the Occultist from the Mummy's Mask Character Add-On Deck. And Mavaro, my friends, is truly the Best. Character. Ever. Just look at that extremely regal man! Mavaro is the most versatile character ever made for the game—even more so than Rise of the Runelords Lini, and she was majorly versatile. At any given moment, Mavaro can potentially have any skill in the game, and that skill will be equal to his highest base skill, his Intelligence. 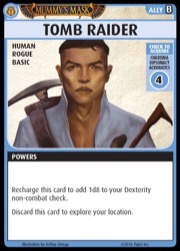 This is thanks to the amazing power that allows him to display a boon from his hand and gain all of the skills listed in that boon's check to acquire section equal to his Intelligence, and that effect lasts until the end of the turn. So, right from the start of the game, Mavaro can have a d10 for every base skill as long as he has a Blessing of the Elements to display. He can also use (almost) any weapon in the game with his Intelligence as his base die: reveal it to use your Strength (for Melee weapons) or your Dexterity (for Ranged weapons) skill and then display that same weapon to gain that skill equal to his Intelligence. Take a look at those skills. They can ALL be yours! This extreme versatility also bleeds over into his deck composition. Mavaro's deck list starts off with no weapons, spells, or armors in it. However, he can treat all three of these card types as if they were items, and he gets nine of those to start. This means that you can tailor his deck to your liking at the end of any scenario. Do you know that the next scenario has a lot of golems in it, which are notoriously immune to spells? Drop all your attack spells and pick up a few extra weapons. Are there a lot of locations coming up that require Wisdom checks to close? Pick up a few items that can give you a good Wisdom skill. The only "static" cards in Mavaro's beginning deck are allies and blessings, so it's important to choose them wisely. Every card that you put in Mavaro's deck should have the ability to grant him a skill that he either doesn't have at all, or is not very good at. Diversity is key, since you want him to have a card somewhere in his deck for every situation imaginable. 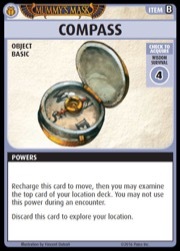 This also means that Mavaro is a huge fan of examining cards in his location deck. Even though the Trigger trait might make this a bit of a gamble sometimes, it's important to know what is coming next so that you can make sure you will have the card in hand to grant you a needed skill. All of these cards are excellent choices because of their myriad of skills to acquire. 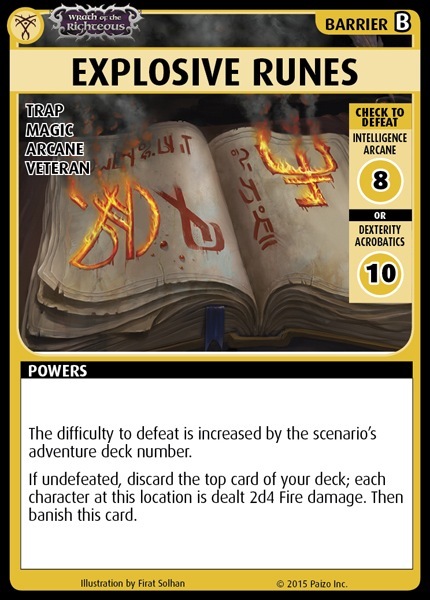 I could go on for pages and pages about the best cards to pick for Mavaro as you move up through the adventure decks, but we should probably talk about Mavaro's role card a bit. His roles are Acquisitor and Channeler. The Acquisitor, as you might expect, is really good at acquiring new cards. Without any power feats, Mavaro can discard a card to add a die to his checks to acquire. Using a power feat, he can give that benefit to other characters at his location. And in the Acquisitor role, he can take a power feat to reduce the cost of that power from discarding a card to merely recharging a card. 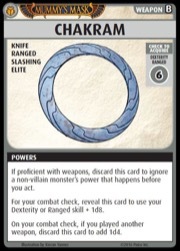 One of the best feats in this role, however, is the ability to set aside items from your hand before you reset your hand, effectively increasing your hand size significantly if you've got several items in hand—and you could potentially have as many as 8.The Channeler role focuses strongly on casting spells, gaining the Arcane and Divine skills. Additionally, like his RPG equivalent, Mavaro can channel magic from objects into spells. 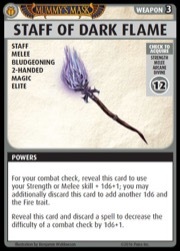 In the PACG, this takes the form of recharging a weapon, and armor, or an item to summon and play a random spell that has the Attack trait, which is pretty amazing. Each of Mavaro's roles also offers a power feat that lets you affect your Intelligence checks after the roll. The Acquisitor's version lets you bury a card to add or subtract 3, while the Channeler lets you discard an item to reroll the dice! These are both really excellent powers for Mavaro, though it's important to remember that not all of your checks are going to be based on Intelligence... His first power lets him gain skills equal to his Intelligence, but doesn't actually use his Intelligence, which is an important distinction. I honestly have trouble choosing between these two roles... They're both amazing! Finally, I'd like to talk a little bit about the Pathfinder Society Adventure Card Guild organized play program and how Mavaro can be used there. 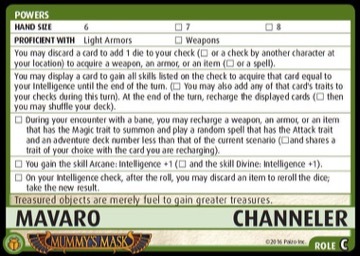 Though Mavaro doesn't have his own Occultist Class Deck, Mavaro can be unlocked for PFSACG play by completing the final adventure of Season of the Runelords. You'll use the Inquisitor Class Deck with him, which is a great deck of cards overall but does have some pitfalls when it comes to Mavaro. 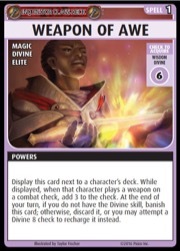 First, like many Class Decks, the Basic blessings are Blessings of the Gods, and that card is one of relatively few in the game which has no check to acquire. This makes all four of his starting blessings useless for his best power. You will quickly want to replace them with blessings that have at least Divine as an acquire option, which you can then display to make use of several excellent Divine spells in the deck, including Weapon of Awe and Divine Favor. 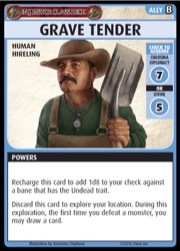 You can also grab a Grave Tender as an early B ally upgrade. This deck is also a bit sparse with items for an Occultist, though Archer's Bracers and Blood Periapt are solid choices from the start, and picking up the Manual of War is almost essential. That's it for today, my friends. I hope that you can forgive my falsehood in my first blog, as I wasn't allowed to talk about Mavaro at that point, and Alahazra is an amazing character in all of her versions. But when it comes to the best character ever, I am going to have to definitively say that it is Mavaro... at least until Lone Shark Games come up with an even more amazing character! Until next time! Really, I'm trying Mavaro to see what the fuss is about. But I tried Alahazra first. And more. And she is better. Mavaro is absolutely fantastic... But I am with Eliandra on that one. Alahazra is just Wisdom Incarnate. Nothing can compare. 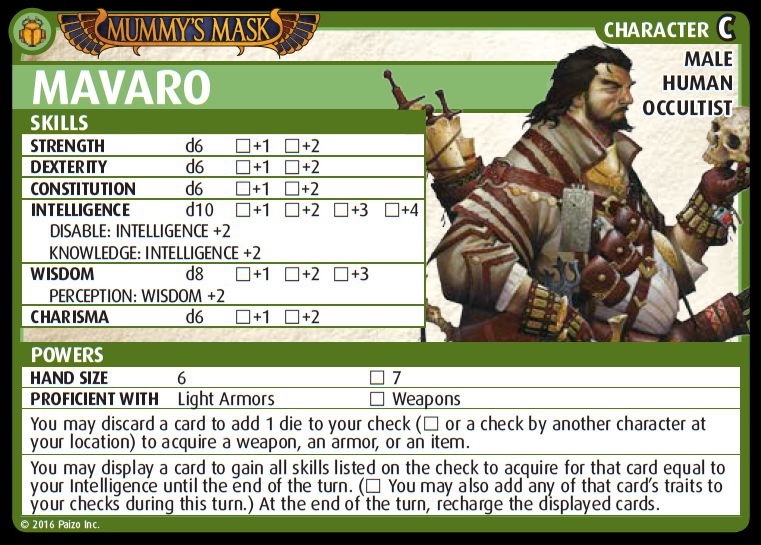 Mavaro just seems much too fiddly to me, and too likely to have the right card in his deck but not in his hand when needed. That Blessing Of The Elements card looks pretty cool. So there are six major elements instead of four (aka air, earth, fire, water, life, and death). Interesting. 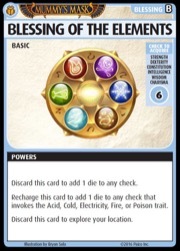 Actually, in the card game, the elements seem to be fire, cold (water), electricity (air), acid (earth), and poison. And don't forget the Honaire loot (ally) bug. 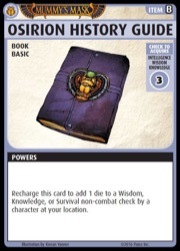 Estra gets the card as a player, but if she dies - say by discarding her hand every turn and drawing new cards - all her cards are available to other heroes for deck construction under the dying rules, provided Estra isn't chosen as the replacement character because her sheet only specifies Honaire must be part of her deck. I haven't found anything preventing this situation in the rulebook, so hopefully Honaire's card says something like "Banish this card if Estra dies." Before you ask if anyone will do this, remember 50% of the country modulo 2 million people, felt "That means I'm smart" was a good answer to loopholes in the U.S. Tax Code. Silly question, Autoduelist, why is the Estra & Honaire garbage on this blog thread? Not really cool trying to hijack a thread when there's one out there. This is a thread about card strategy. People were saying Honaire + Mavarro would be pretty awesome. If people want to do it, and the rules allow it, who am I (or you) to complain? Thanks Brother Tyler for stepping in. True Seeing would reveal that Tyler Beck is a valuable playtester and occasional contributor and gets _very_ excited about some characters. When he asked if we'd take a "Favorite Character" blog for Alahazra, we cheerfully accepted, and when he asked if we'd take a Mavaro strategy/new favorite character blog, we again cheerfully accepted. Also, it'd reveal that my game work time is highly limited and I'd much rather work on new cards and scenarios than blogs (but that's just me! ), and I'll need to dash behind this curtain if you're going to keep using True Seeing in mixed company. Really, now! While I am happy to advertise how much I love the PACG and characters like Mavaro, as Keith said I wasn't asked to write this, I asked if I COULD. I don't think I'd call that "Advertising Testimonial". We have a goal to produce a blog a week, so when Tyler or David or Shannon gives us content because they want to, we greedily accept it. This can work for you too. Send us something and we'll tell you if we want to post it. I'd enjoy seeing who Autoduelist's favorite character is in blog format (it's always entertaining to see the views and cards and what-not); and other players' favorite characters, too. But enough of that. This one is about Mavaro. I'm playing Mavaro through Mummy's Mask right now. We've only gotten through the first scenario so far, but his versatility was very interesting and helpful. My only concern is that versatility comes at a cost - the more versatile you make him, the more you're relying upon the luck of the draw to have the right card(s) when you need them. The ability to cycle cards mitigates this somewhat. Of course, there's also the meta-versatility in tooling him up in preparation for scenarios, changing the card mix in his deck as needed. I know that some players have mentioned the option of making Mavaro more focused, especially when he can fill a gap in the overall party composition, but I'm going to play the versatile strategy for now. 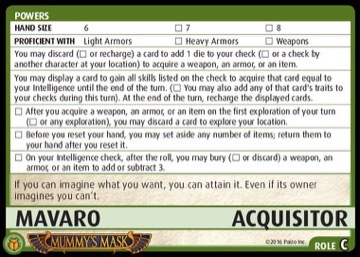 Overall, Mavaro will benefit greatly from canny use of the new Traders mechanism and between scenario deck rebuilding. I'd say that Mavaro is probably my hands down pick to attempt a solo run through any of the adventure paths, if I ever dare such a thing. This is THE card that Vic should retrofit to get the trigger trait. Since day ONE of D&D. I wonder how many "marked as favorite" can I get if I launch a petition for that retrofit. I would support such an initiative. If I get around to it, I kind of want to try to run him solo through SotRi. Because I'm CRAZY. My only concern is that versatility comes at a cost - the more versatile you make him, the more you're relying upon the luck of the draw to have the right card(s) when you need them. The ability to cycle cards mitigates this somewhat. Just to emphasize Mavaro's ability to cycle cards... the community consenus (in this thread) is that at the end of his turn, Mavaro can display any number of cards, as long as each gives him as skill he has not yet gained in the same fashion, so as to then recharge them. So he cycles better than nearly anyone. Make that 2 in favor! Thanks again, Brother Tyler! I'd like to extend my gratitude a second time for turning this thread around. I've got over 300 hours invested in PACG, but almost all that time's been devoted to the Adventure (story) guides, character guides, and blessing guides that I've worked on. At this point, the guides have become a bit of a "game" itself, as I'm laser focused on blog posts featuring artwork (which I can use for the guides) and crawling over sites like PathfinderWiki to learn more about the setting so I can create better guides. It's been nice dusting off those creative writing skills. Byron "Kittenhoarder" Campbell over at BoardgameGeek had a great idea creating a story document for the card game, and I just had to pitch in to help make it a reality. Byron wrote the Adventure guides for Rise of the Runelords and Skull & Shackles, while I wrote the guide for Wrath of the Righteous. We're currently on deck for Mummy's Mask. I'll let Byron know about the blog posts guidelines. Maybe we could submit something to help Lone Shark with their weekly entries, perhaps a serialized story guide? I only completed Rise of the Runelords recently. I played Seoni in a party containing Kyra and Merisiel. Seoni was a good monster hunter in the early scenarios when Kyra and Merisiel didn't have weapon skills. She's also a Blessing machine, and I frequently assisted Merisiel and Kyra on their checks. It's a lot less risky making them fight the monsters for the price of a Blessing, and I'd often chip in to help them acquire better weapons or armor at the price of exploring less often. With her Charisma, Seoni had no problems recruiting allies, and she cleared out Turtleback Ferry almost single-handledly when Black Magga attacked. It's a lot easier for Seoni to be helpful when Kyra is around for healing. Merisiel enjoyed teasing Seoni that she should be suspicious of all the time Seoni and Kyra were spending together before skulking off by herself to explore locations. I still personally believe this is contrary to the game's intent (because we're only supposed to be able to use powers when we can make use of them), so I didn't include that as part of my discussion of how to play him. However, if you choose to play that way, obviously it makes him a BEAST at cycling through to find the cards you really need on your next turn. Noted that you guys would prefer that Explosive Runes was more painful. Got it. Yes -- the caveat is there is no official ruling on this. I just discovered that the linked images for the cards in this blog are mostly lo-resolution, in particular Mavaro's roles. Any chance they can be swapped for the more typical high resolution ones? Can we please (pretty please) get an official ruling on this "end of turn" cycling ability? I'm playing Mavaro in a 5p MM campaign (we're about to start scenario B-4), and I've been playing that Mavaro can't arbitrarily display cards at the end of his turn. I'm doing this because, like others, I want to play by the spirit of the rules - or what I think they are, anyway. Sorry, we let this one slip. We'll get you an answer as soon as we have a ruling. 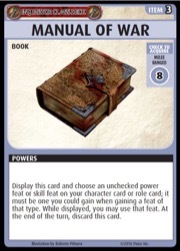 With GenCon over and Apocrypha in release, I thought you might have time to make a Mavaro decision. After a break, our Mummy's Mask campaign is starting up again, which is why my interest is re-piqued. Anyway, thanks in advance for your help. 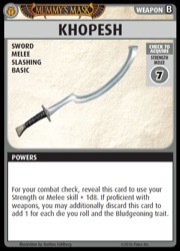 Is it fair to assume that character rulings are temporarily on hold until the new PACG is released? I played Mavaro in a five-player, man-is-this-long MM campaign that lasted from April 2017 - September 2018 (yes, it finally ended). Unfortunately, the abovementioned ruling on Mavaro's display ability was never released. Not a big deal, really. I still had fun. 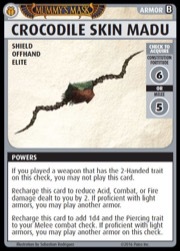 I'm just curious if the Mark II PACG design means that character clarifications are on hold until 2019. Note: Other characters in need of FAQ entries can be found here.